In the right hands, the 88 keys on a piano offer unlimited creative possibilities. To a talented bioengineer, the molecules of the human genome likewise enable compositions of enormous complexity and inventiveness. A University of California, Irvine scientist who has shown brilliance in both music and genetic engineering thinks he has found his muse in the cells of living organisms. For Liu, the fascination comes from two angles: exploring unknown boundaries in life science, and discovering how to use biological materials to build new structures on the molecular and genetic scales. It’s this goal of learning how cells, DNA and RNA, enzymes, amino acids and proteins can be taken apart and reassembled like a gooey erector set that has earned him a place in UCI’s Henry Samueli School of Engineering. “I came here initially through a search by UCI’s multidisciplinary Center for Complex Biological Systems,” Liu says. “I was matched with the Samueli School because of my work in genetics, which many consider to be a frontier in engineering.” He now runs a lab in UCI’s Natural Sciences II building with six Ph.D. students, three postdoctoral scholars, two lab technicians and two undergraduates. The Tucson, Ariz., native earned a bachelor’s degree in chemistry at Harvard University, but science wasn’t the main reason he moved from the Southwest to Cambridge, Mass. Now Liu and his lab mates are attempting to engineer cells that have new capabilities using a novel approach to biological research known as directed evolution, a method used in protein engineering that mimics the process of natural selection to evolve proteins or nucleic acids toward a user-defined goal. “The larger theme of our lab is trying to engineer genetic systems that can process and transfer information,” he says. While the role of DNA is to store and propagate information, it doesn’t actually “go around performing functions at the cellular level,” he notes. Instead, instructions are transcribed from DNA to RNA and translated to proteins, which are the more functional molecules. Liu and his colleagues are working to get to the bottom of this process to see if they can evolve the genome at will to perform such desired actions as attacking diseased cells and boosting healthy ones. Genetics researchers tend to develop a certain level of respect and admiration for this system that has taken eons to evolve to what it is today. Liu says the genome is based on a set of inert chemicals that sorted themselves out billions of years ago, so it’s not possible to just go in and rearrange molecules. If a reactive chemical were introduced into the genetic code, “cross talk” would cause the cell to die. Liu’s lab has improvised a way around this problem by developing a technique called orthogonal DNA replication, in which the host’s genetic code is augmented by an engineered one inserted within the same cell. 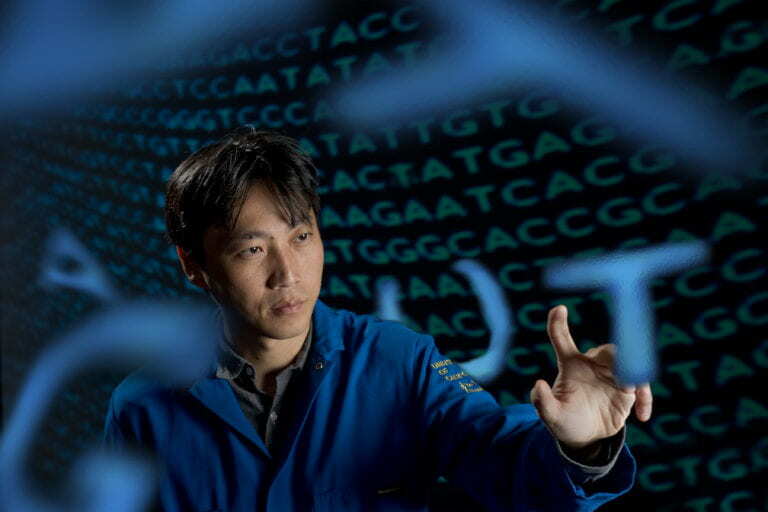 “We’re basically installing reactive and chemically privileged groups into the genetic code that are not normally there so that we can make proteins that are better therapeutics,” Liu says. In other words, his team has learned how to create cells with an auxiliary replication system, an enzyme that works with a piece of DNA that’s living in the same cell but acting independently of that cell’s genome. This allows Liu and his colleagues to experiment on genes at very rapid rates in the lab – the goal being to make cells that accomplish beneficial tasks. “A lot of our projects are figuring out how to experiment on cells at rates necessary to see evolution occur in the time scales of a laboratory rather than in the natural biological world,” he says. These efforts have drawn the attention of leaders in this area of research beyond UCI.